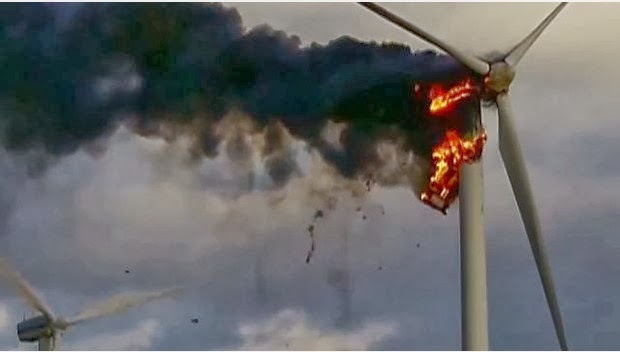 As Australians brace for a searing summer, spare a thought for communities riddled with wind turbines: the perfect incendiary device. First, we’ll take a look at a few ‘clean’-energy conflagrations in Europe. Rhede. 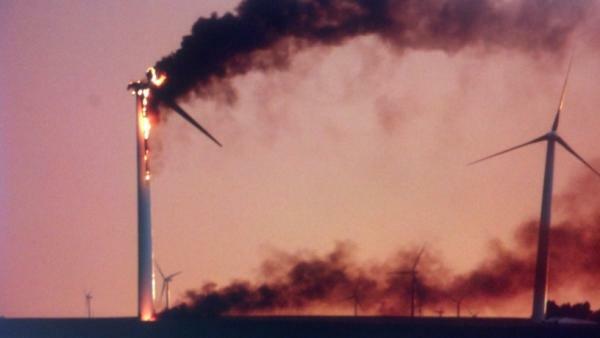 In the wind energy park in Rhede, a wind turbine is completely burned down by a fire in a power house. The operating company Windpark Rhede GmbH & Co. KG assumes that the resulting property damage could amount to up to 1.5 million euros. The fire department brought the fire equal to three missions. 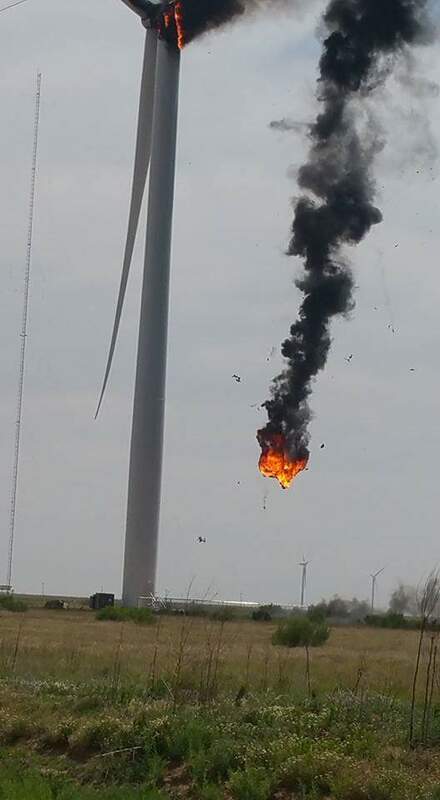 According to the police, the fire broke out in the wind farm on Q-way in the northwest of the community at 3 clock on Friday morning. The fire had broken out in or at a machine house and had then spread to the entire plant. As a spokesman for the police says, a wing of the wind turbine fell off after a short time. Large parts of a second wing followed later. Although the third wing did not burn, it also threatened to fall down because the nacelle of the windmill was largely destroyed. At 7 o’clock the fire was under control. Since the engine house is located at about 90 meters altitude, the fire department could hardly intervene. It has neither such a high ladder nor so powerful pumps to get the water to such heights. “It had to be burned down controlled,” said the police spokesman. The fire brigade shut down the site with the support of the construction yard of the community Rhede. 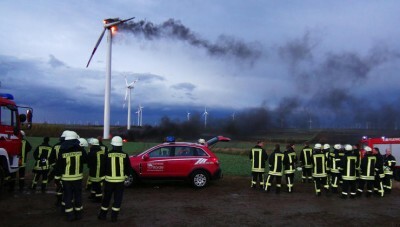 Stefan Schöpper, community steward of the fire brigade Rhede, reported on request that the burning wind turbine was already visible from the center in Rhede. “We did not have to search the place of the fire this time”, says Schöpper. The fire department moved out with two vehicles and 16 forces. As it concerns a bog area, the concern was great first, that similar to how on the WTD terrain a Moorbrand could develop, so the spokesman. That did not happen. In the meantime, however, an embankment had to be extinguished, which was caught by a falling part on fire. At 7 o’clock one of the two fire engines could leave with eight forces. 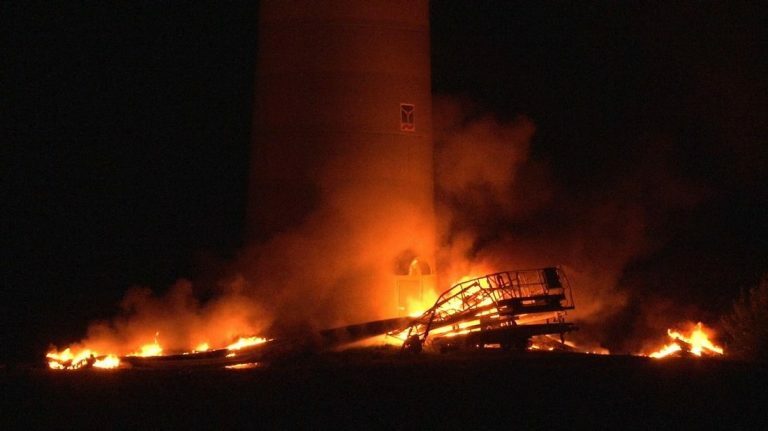 At that time, the windmill was mostly burned down, in addition, the capabilities of the rescue services were very limited anyway. A service car, which, according to the municipal steward, was located right in front of the windmill indicated that there had been maintenance on the plant. The maintenance car was badly damaged because a burning wing had fallen directly on it. It was also this wing, which was lying directly on the tower in the late afternoon at 17 o’clock again due to still existing fire on fire and the fire brigade Rhede gave her third use on Friday. Previously, the forces had already left a second time in the noon hours to extinguish a directly adjacent conservation, which had also caught fire again. The wind farm Brual, located between the Dutch border and highway 31 in the northwestern tip of the municipality Rhede and the district of Emsland, consists, according to the operator of 20 wind turbines. Together, they have a rated output of 42.2 MW and the park can generate up to 100 million kWh of electricity per year. This corresponds to a requirement of up to 28,000 households. 17 of the wind turbines are of the type Enercon E-66 / 18.70, each with a rated output of 1.8 MW, a hub height of 98 meters and a rotor diameter of 70 meters. The wind farm has been enlarged by three plants over the past three years. All systems are managed by the Enercon service under an EPC contract (full maintenance contract), the website of the operator states. 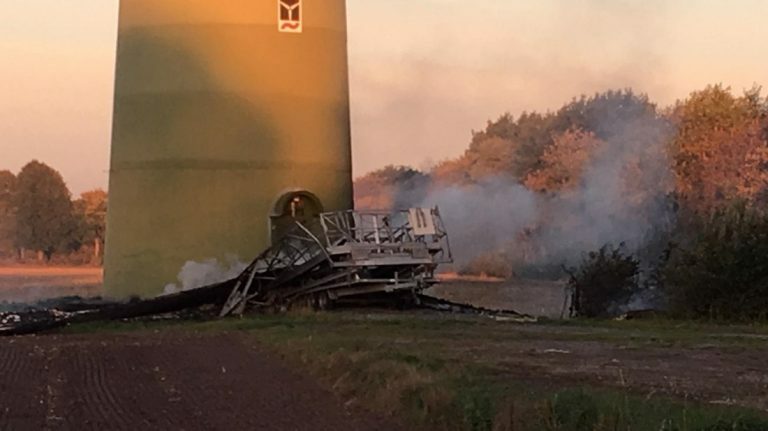 It is not the first fire of a wind turbine this year in Emsland. 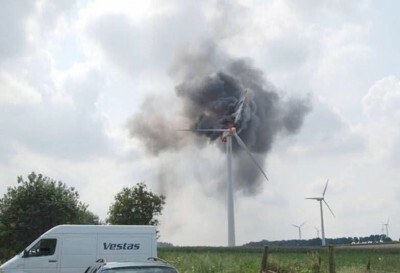 At the end of August, a wind turbine burnt down in Haren. 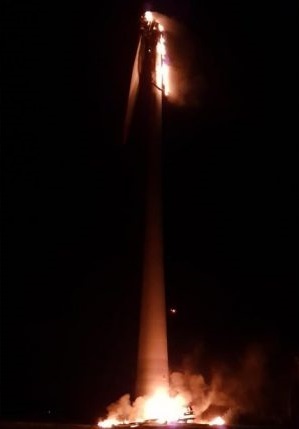 This was also from the manufacturer Enercon and in this case, maintenance work is suspected as the cause. In Haren, the amount of damage was estimated by the operator to be up to one million euros. In July 2016 burned down in the district Renkenberger Melstrup-Siedlung from a wind turbine. 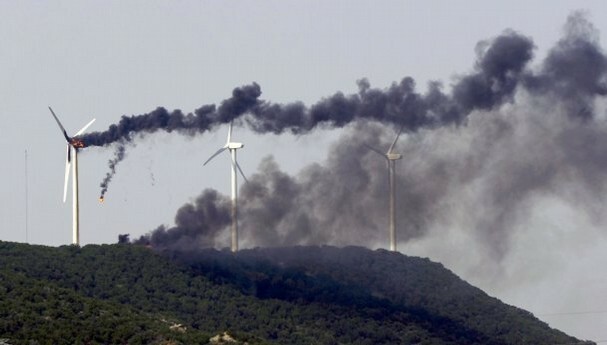 The wind farm operator estimates the damage here at more than one million euros. 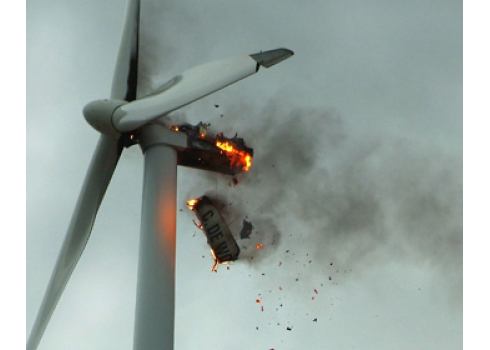 The cause was a technical defect in the nacelle of the wind turbine. 1,000L of “non-combustible” gear oil goes up smoke. 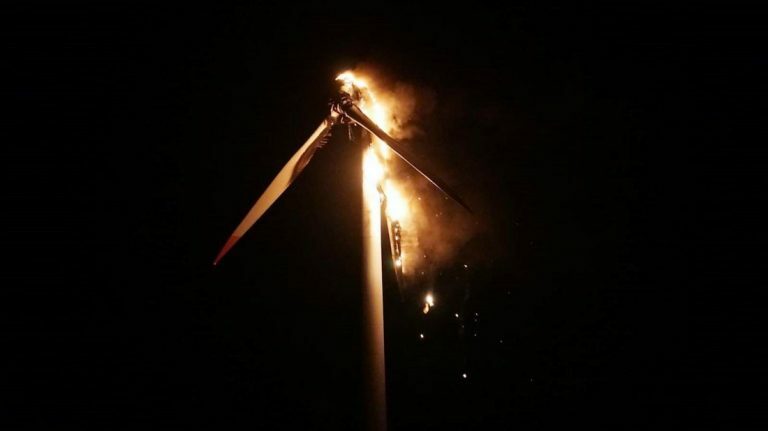 Wind turbines are the perfect incendiary device: packed with flammable and toxic oils, plastics, fibreglass and low-ignition point metals, like aluminium, when one of these things spontaneously burst into flames, everybody for miles around knows all about it. For those country folk nervous about the terror that comes with an out-of-control bushfire, here are a few fun facts about the Vestas V112. During the Australian Senate’s wind farm enquiry in 2015, the Country Fire Authority claimed that the oil in question was “non-combustible”. Here are a few pictorial retorts to the CFA’s claims that 1,000 (or more) litres of gear oil won’t explode in a thrilling pyrotechnic display. Goodness gracious, great balls of fire. let the motherf%#ker burn, Burn motherf%#ker burn! 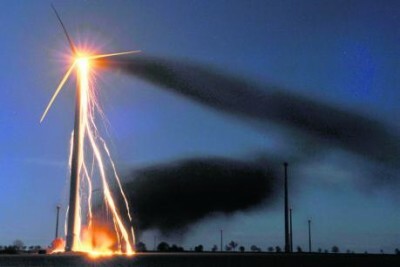 Welcome to your (terrifying) wind powered future! I’m sure they’ll soon fix this bad publicity with a spot of photoshopping.. The inherent flaw in these expensive and delicate machines is that in order for them to generate any usable energy at all, they must be placed fully at the mercy of the elements. Offshore turbines in the North Sea winters will suffer even more (wind and wave plus corrosion), but at least they will not be starting any wild fires nor will they be harming people who live in nearby neighborhoods. Seabirds take heed, however. 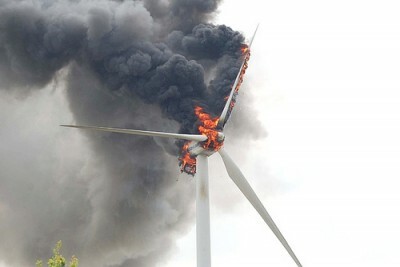 Bush fire hazard from burning wind turbine oils and combustible components is a real problem. 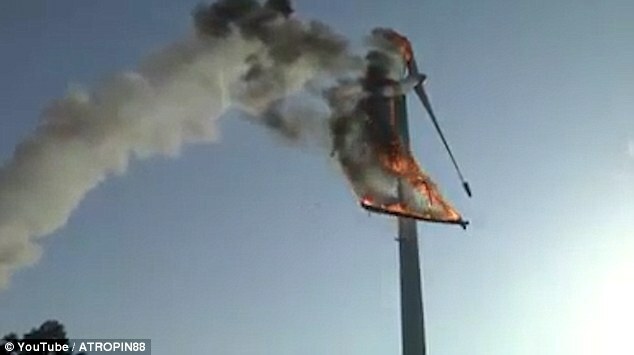 All we need is a windy hot summers day, when the north wind blows and a turbine explodes. 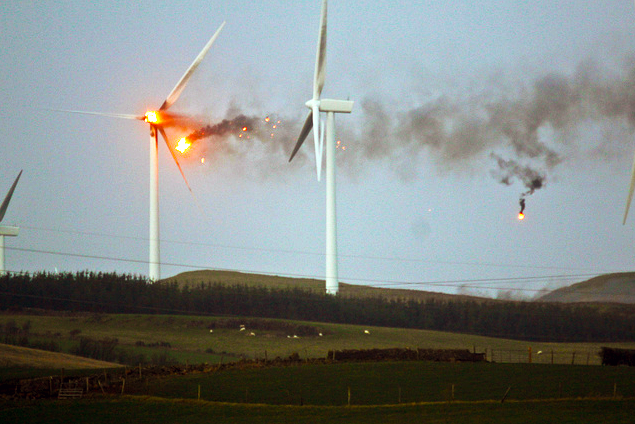 Who will answer to the charges of manslaughter when people die in a fire started by these turbines? 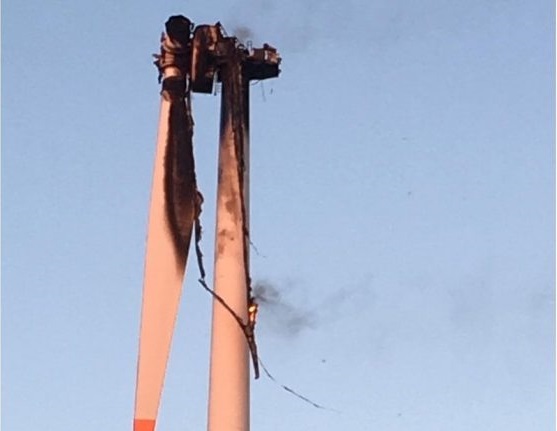 We are constantly on watch for firebugs who have the ability to destroy many lives and livelihoods, the environment and all that lives in it – but these things – turbines are by some an acceptable visual nightmare in more ways than one. They cannot be extinguished quickly by fire-fighters and have to be left to burn themselves out, with no fighting a spreading fire until it jumps out of the ‘danger’ zone. A zone where it is estimated burning debris could fly, that is unless a fire-fighter decides to risk their life and move into the ‘danger’ zone below the burning Nacelle and blades because they can see a far greater danger occurring if a fire moves out of this zone. The wind which these companies pray for and rely on for their profit is also the moist dreaded thing for rural and regional people on a hot summers day when the earth is dry, water is scarce but who cares amongst those with the power to stop this nightmare. None of them care because they are not in danger. But they will no doubt attempt to sound sincere when death and destruction occurs and they are sitting in front a TV Camera offering condolences and sorrow at peoples loss – will that help ease the pain? NO, it wont because no other industry would be allowed to operate if they did not have an effective fire-fighting system/procedure in place and structures were designed so the fire brigade could have access to water or other substances needed to put out oil fires and the ability and equipment to fight a fire in these things. 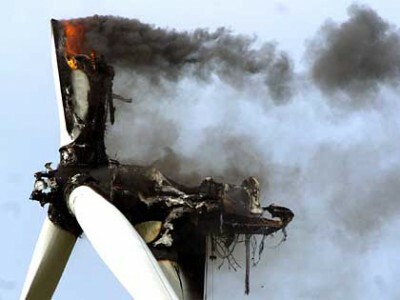 Another Ash Wednesday or Black Friday is going to happen and it could be as a result of a turbine fire, all that is needed is a hot dry and windy summers day and an incident waiting to happen to happen. The machinery in these structures are man made and as such they all have an inbuilt self destruct flaw, nothing we make is perfect and its time people accepted it and did everything they can to prevent harm ensuing when the machinery does decide to self destruct. No one in authority seems to want to accept the dangers of placing these structures in places where they cannot be effectively controlled when self destruct mode happens!!!! Well presented STT – who says the fires of ‘hell’ are a myth! Nothing like a bit of non combustible oil ?